Injury problems: Yorkshire's Katherine Brunt. barnsley’s Katherine Brunt says she will have to be cautious with her fitness in the build-up to England’s World T20 campaign in the Caribbean this November. The Yorkshire Diamonds all-rounder has been dealing with a long-standing back injury, which meant she missed the opening game of the ongoing Kia Super League. She would have also missed the third, but for rain. Brunt, 33, is due to play in all of the Diamonds’ remaining three KSL games, starting against Surrey Stars at York tomorrow (2.30pm). But she admits that plan could change. “It’s all about management and being smart,” she said. “It’s a hard one really. I feel all right, but we have a T20 World Cup coming up and I want to be a part of it. “We’ve had a busy period with England and a lot of preparation before that. “I’ve got to be smart and listen to the physios and the England coaches and take it game by game. “At the end of the day my priority lies with England. “I love to play in these games because I’m learning a lot, and this will help me massively for the World Cup. I want to play in as many as I can. “The plan was to always miss the first one at Taunton and the Surrey trip, which was rained off. “That gave me a lot more time between the England series finishing and this starting. Brunt captained the Diamonds in their 16-run defeat chasing 160 against Southern Vipers on Wednesday due to a bout of food poisoning for regular captain Lauren Winfield. “You can really lose your head at games like this and go at a lot of things,” she said. “But I think it’s just execution. Yorkshire are at the point of no return in the KSL. 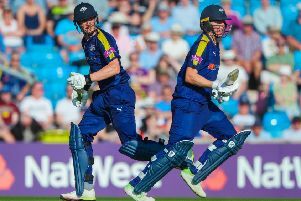 They have to win their last three games against Surrey, Lancashire and Loughborough to have any chance of reaching Finals Day at Hove on Bank Holiday Monday, August 27.